I’m a firm believer that everyone needs an amazing banana bread recipe in their repertoire! 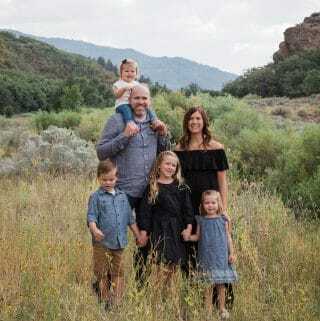 So today I’m sharing our family’s favorite, go-to recipe for the best banana bread ever! It’s buttery, moist, and loaded with banana flavor. Plus it’s easy to make and most definitely the best way to use overripe bananas! 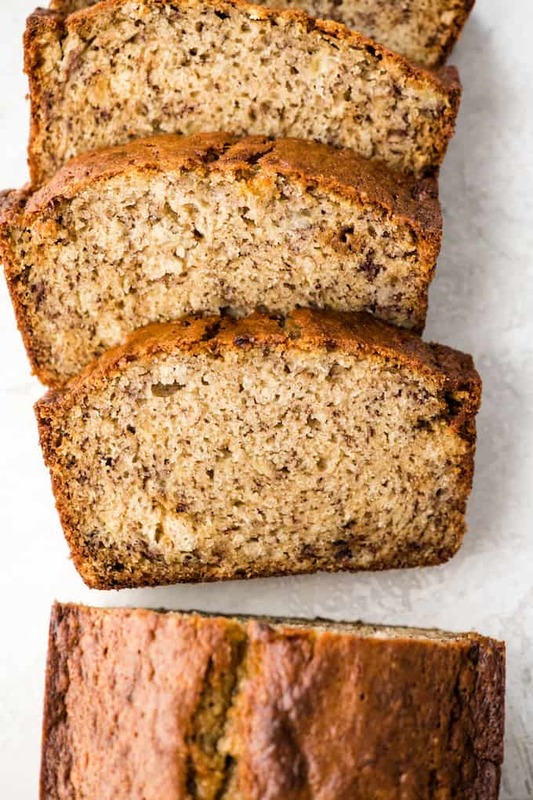 It took me many years and lots of testing and tweaking to finally arrive at this banana bread recipe and feel like I can truly claim that it is the best of the best. It only takes a handful of simple ingredients and a few minutes to make, and I promise you will LOVE it as much as we do! How do you make banana bread? All righty folks! 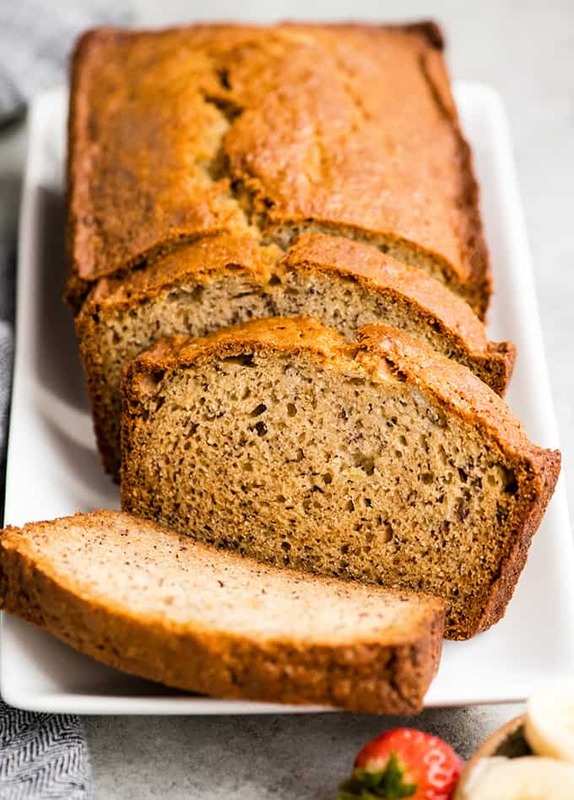 Even though this recipe is super easy, I thought I’d walk us through the process step-by-step so that you all end up with perfect banana bread every single time! Step 1: Mash the bananas! 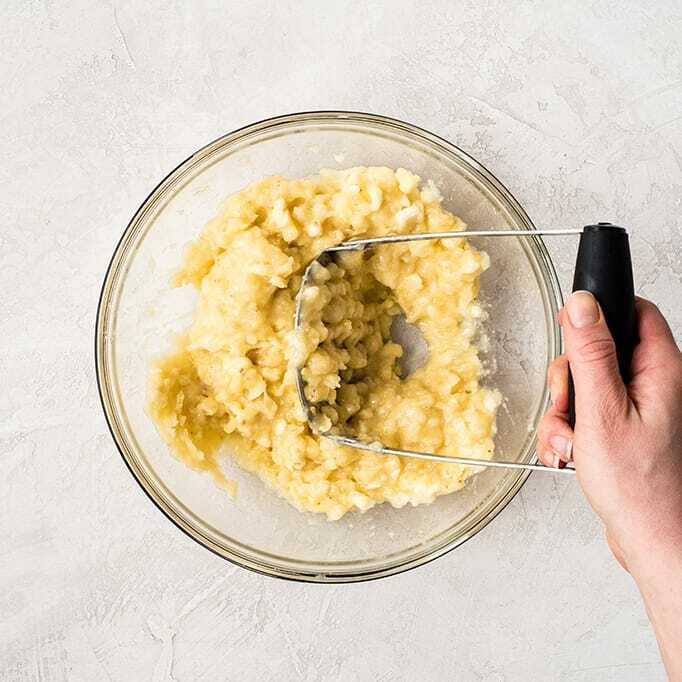 The very first step in this banana bread recipe is to mash the bananas! Add the whole bananas to a large mixing bowl and use a fork or a potato masher to mash them! I have had this potato masher for over a decade, and it’s the only way I ever mash anything (bananas, potatoes, beans, etc). I love it! Are my bananas ripe enough to make banana bread? Make sure you use overripe, brown bananas! They have the best flavor, maximum sweetness, and are the easiest to mash! They should be very dark brown or almost black and soft to the touch! Next, mix the wet ingredients together. Be sure the butter is melted and the eggs are room temperature for the best results! 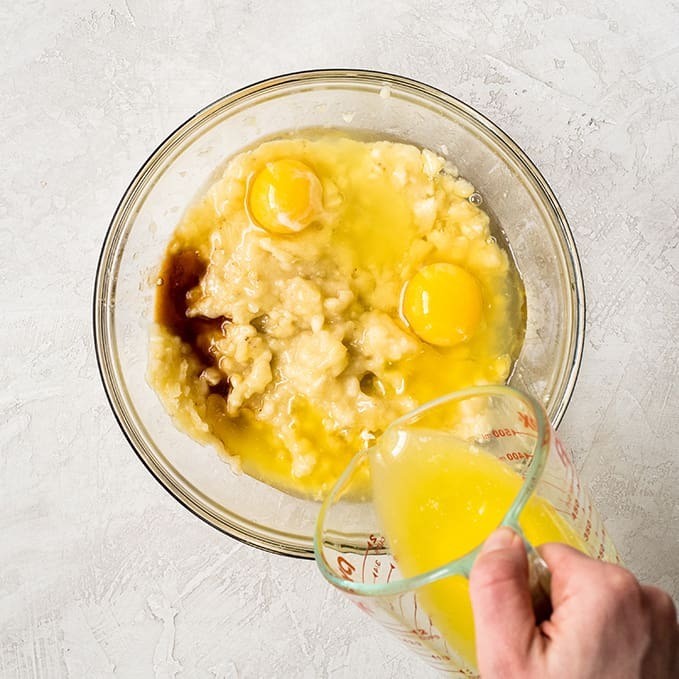 To quickly make a cold egg room temperature, simply submerge the egg in warm water and let it sit for 5-10 minutes! I always recommend adding sugar to the wet ingredients before adding the dry ingredients. Especially in recipes, like this easy banana bread, that are mixed by hand. Stir the mixture thoroughly until you are certain the sugar is dissolved and there are no lumps. 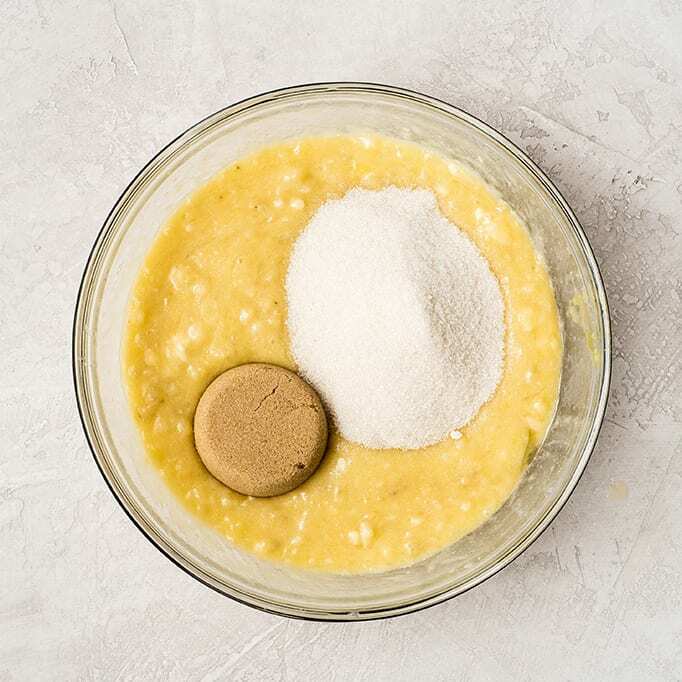 The next step in this banana bread recipe is adding the dry ingredients. You can mix them together in a separate bowl and then add them to the wet ingredients, however that just makes one more dish to clean! So I usually just add the dry ingredients to wet mixture and stir them a little bit on the surface before combining the two! 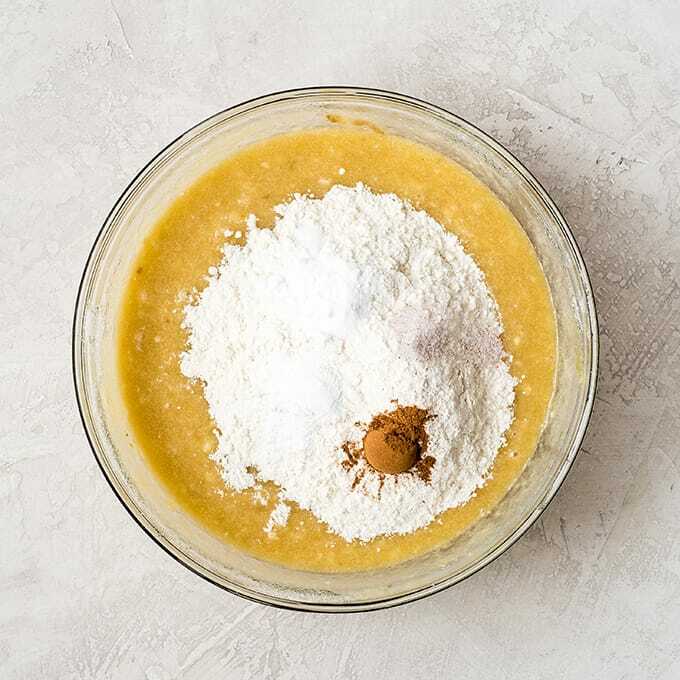 Be sure to stir all the ingredients together until you are certain there are no clumps of dry ingredients hiding in the banana bread batter! (This can be tricky because the mashed banana sometimes looks like clumps of flour)! We have done a less-than-perfect job of this in the past (especially when my kids are helping) and end up with flour clumps in the final product – no bueno. Step 6: Pour batter into pan & bake! 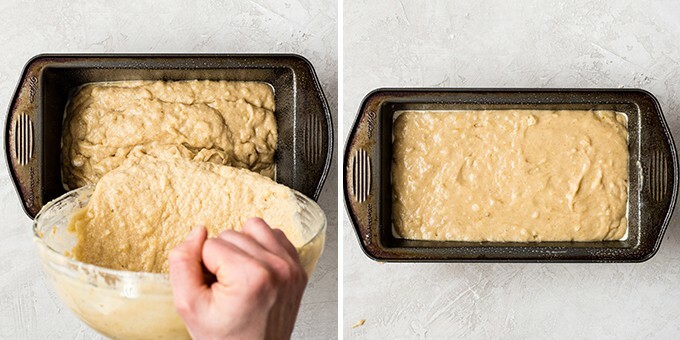 Next pour your well-mixed batter into a greased loaf pan! Use a spatula to spread the batter evenly in the pan. Then pop the pan into the preheated oven and wait! Note: It’s very important to grease your loaf pan well to ensure easy removal! I use a non-stick spray. However you can rub the sides with butter or shortening if desired! The top is golden-brown and set (not jiggly). The sides of the bread start to slightly pull away from the loaf pan. A cake tester inserted in the center of the bread comes out clean or with very few crumbs. Side note: I am obsessed with this cake tester. My mom bought it for me one Christmas and I honestly thought I would never use it….but I was SO wrong. I use it every time I bake and even purchased a second one! $6 well spent! Let the banana bread cool in the loaf pan on a wire rack for at least 15 minutes. This will ensure that the loaf doesn’t tear or come apart when it’s removed. 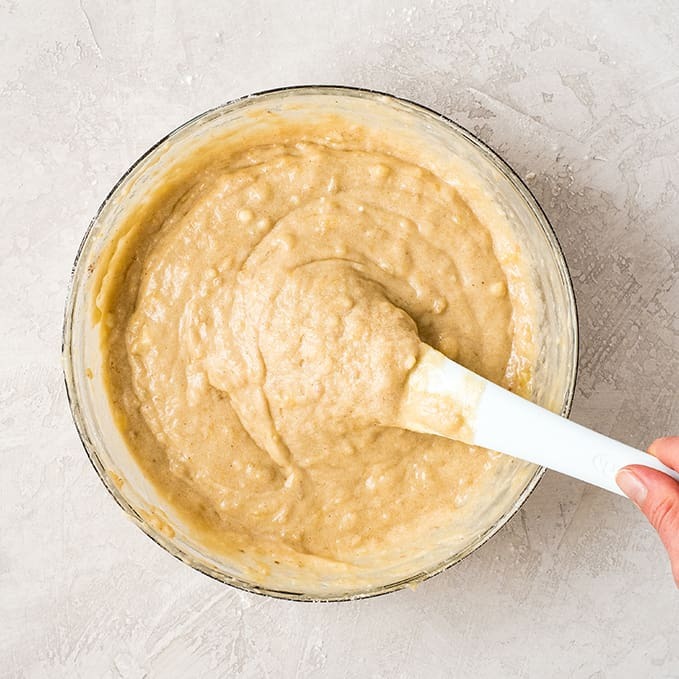 To remove the banana bread from the pan, take a knife or a thin spatula and gently separate the bread from the sides of the loaf pan. Shake the pan to see if you have released the sides. Once the bread is released from the pan, turn it out onto a wire rack to finish cooling! 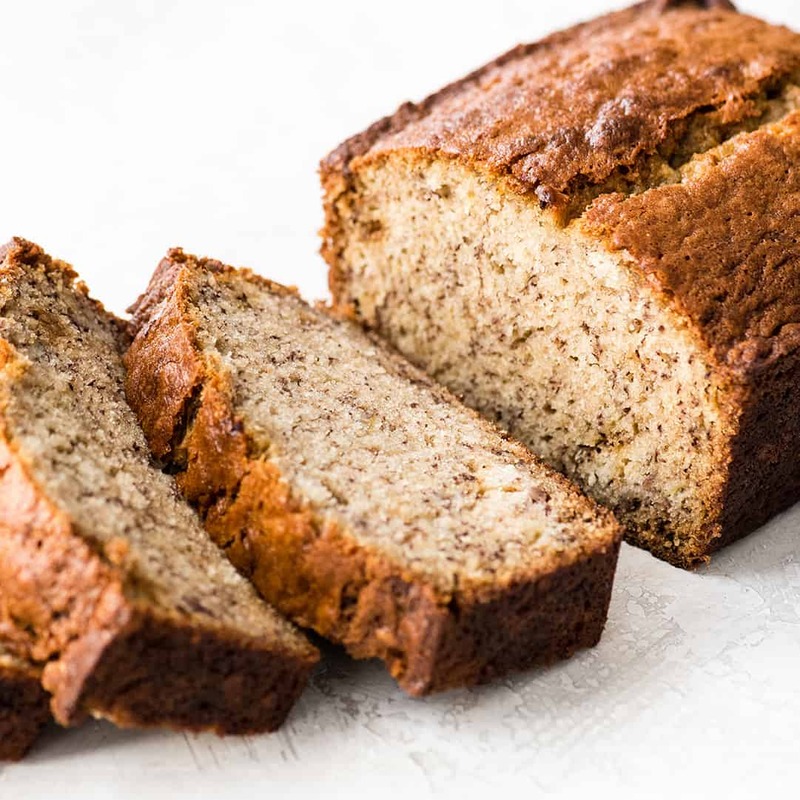 Store this moist banana bread in an airtight container or plastic bag to ensure it does not dry out. If you plan on eating the entire loaf in a day or two, feel free to store it at room temperature. If it will take longer, I recommend storing this best banana bread in the refrigerator. YES! 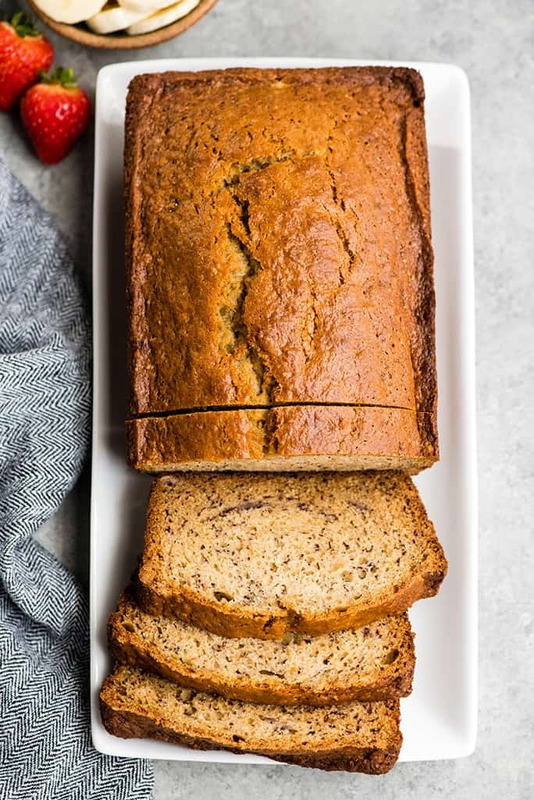 I recommend freezing this banana bread in slices in an airtight container! That way you can pull out a slice at a time to enjoy! 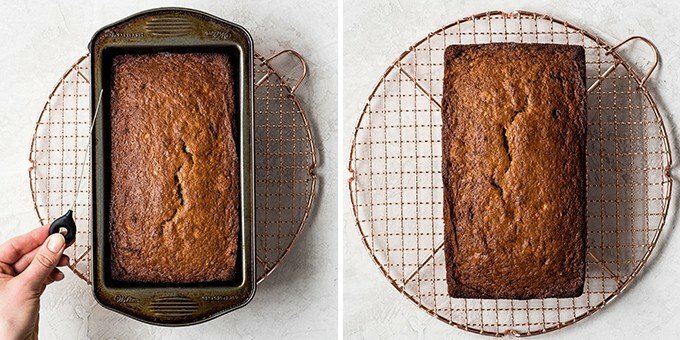 How do you keep banana bread moist after baking? 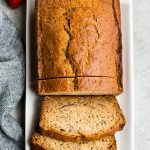 The key to keeping this easy banana bread super moist after it has baked is storing it in an airtight container or ziploc bag as soon as it is cut into. Don’t leave the cut loaf sitting out, exposed to the air, for longer than necessary! 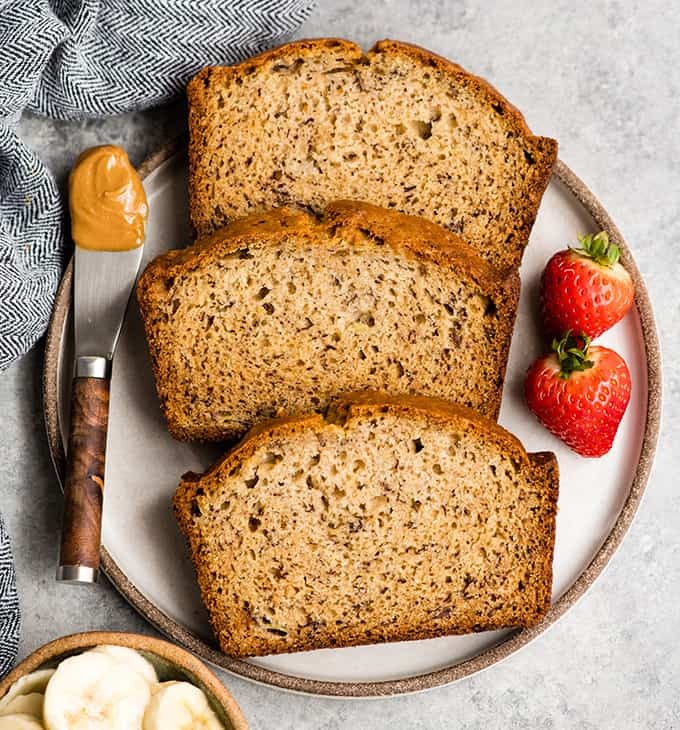 Let’s take a minute to chat about the ingredients used in this best banana bread recipe, and possible substitutions. Remember, the quality of ingredients used in a recipe will determine the quality of the final product! Butter. I always bake with salted butter, however unsalted butter works equally well in this banana bread recipe. You can substitute up to half of the butter (1/4 cup) with canola oil or even applesauce if you would like. I tested all of these substitutions, but I found that using 1/2 cup melted butter makes the absolute best banana bread! For a dairy-free version use vegan butter (like Earth Balance), ghee or coconut oil (however coconut oil will leave the bread with a little coconut flavor)! Granulated sugar. I have mentioned this before in other baking posts…I always use this organic cane sugar from Costco in my baking. Feel free to use any granulated sugar of your choice! Brown Sugar. This recipe calls for light brown sugar, but if you want a little more molassesy flavor you may use dark brown sugar instead! All-purpose flour. For the best results I recommend using all-purpose flour. However bread flour also works well in this banana bread recipe. You could substitute up 3/4 cup of the flour with whole wheat pastry flour…but it will change the final product slightly. For a gluten-free version, use 1:1 all purpose gluten-free baking flour. Looking for a healthier banana bread recipe? Then try my beloved Paleo Banana Bread or this Double Chocolate Chocolate Zucchini Banana Bread! This is the BEST banana bread recipe ever! It is easy to make, super moist and bursting with banana flavor! It's made in one bowl (no mixer required)! You can add walnuts or chocolate chips for delicious variations! A great recipe to use overripe bananas! Grease a 9x5” loaf pan, set aside. In a large bowl mix together melted butter, bananas, eggs and vanilla. Stir until combined. Add granulated sugar and brown sugar. Stir until combined and the mixture is smooth. Add flour, baking powder, baking soda, sea salt and cinnamon and stir until the mixture is smooth and uniform throughout. Bake in preheated oven for 50-60 minutes, or until the top is golden brown and a toothpick or cake tester inserted in the center of the bread comes out with just some moist crumbs. Cool in the baking pan on a wire rack for 15 minutes. Use a butter knife to release the sides of the bread from the pan if necessary. Turn the bread out onto a cooling rack and let cool completely. *I have used ¼ cup melted butter and ¼ cup canola oil with great results! The texture of this looks SO SO PERFECT. We have some bananas that are almost to that ripeness. I’m thinking banana bread will be appropriate soon. I’m going to make a loaf today! 🙂 You will have to come back and let me know how you like it when you try it!!! I tried it with a gluten free flour, and it was PERFECT. I followed all the other ingredients exactly, and it was a MOIST but not doughy delightfully sweet satisfying banana bread.